Humanity is not alone in the universe, for the universe you will encounter is full of intelligent life. Living in a well-inhabited and long-established region of space, your world will find itself in a greater neighborhood. Within this neighborhood are many powerful nations that have created vast networks of trade and commerce that are tightly governed. And most nations in this region of space are dependent upon these networks for the essential resources they need to support their technology and, in some cases, essential resources just to provide the basic requirements of life. The world, therefore, is not in some remote and unexplored region of the universe. Your proximity to this great establishment of life gives you certain advantages and certain disadvantages. Your advantage is that war and conquest are suppressed in this region of space. They are suppressed to maintain order and to provide security and stability for the larger networks of nations and their commerce and trade with one another. After going through long eras of war and competition and conflict, these larger networks have been established. In this region of space, war is suppressed and outright conquest is not allowed. 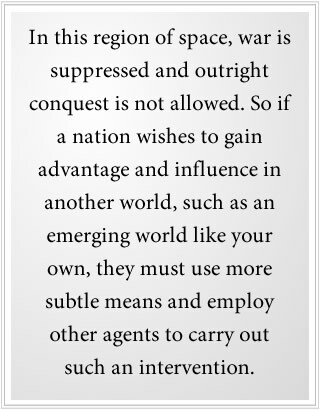 So if a nation wishes to gain advantage and influence in another world, such as an emerging world like your own, they must use more subtle means and employ other agents to carry out such an intervention. You are facing, then, a non-human universe where freedom is rare, a universe that will seem foreign and even hostile to your presence should you escape the bounds of this solar system. Here you will find that you have few friends and allies. But to your advantage, there is a network of free nations in this region of space who do not participate in these vast networks of trade and commerce. They have, over time and through great effort, established their insulation and their freedom to function [without] outside interference. For it is always difficult for a free nation to exist around unfree nations. It is a delicate situation and has been an ongoing challenge for those free races whom you may consider to be the Allies of Humanity.